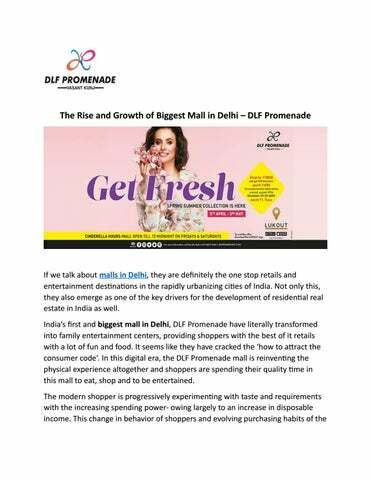 younger generation has led to a disruption in the way the DLF Promenade operates. 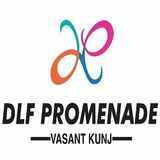 DLF Promenade, Vasant Kunj: DLF promenade is developed by the DLF group. It is one of the first malls developed in Vasant Kunj which is located in the Nelson Mandela Marg. This biggest mall stands amidst two other malls including the luxury mall ‘DLF Emporio’ and a premium brands mall ‘Mall’. This mall is the perfect fit for the area and is one of the best shopping places in Delhi which caters to visitors from the South as well as Gurgaon. The vision of DLF Promenade is simple which is to make it the best destination for fashion, food, and fun. Now, with the introduction of many international and homegrown fashion and lifestyle brands along with new F&B brands such as Zara, Marks & Spencer, Forever 21, Sephora, Satya Paul, Masaba, Aldo, Calvin Klein, and Wills Lifestyle. The shoppers can now experiment more with different fashions, silhouettes, color, and fits. It is one of the most entertaining and exciting places to visit in Delhi for kids because the DLF Promenade provides entertainment with a luxurious environment. It is uber-creative and super innovative kid zones and theme parks. Not only this, they are well-versed in celebrating local festivals, cultural initiatives, and holding events at regular intervals for discerning patrons. It has some extraordinary features like outdoor plazas, amphitheaters, and outdoor fine-dine food court terrace, which adds value to their offerings and services. In addition to its fashion and beauty portfolio, you can enjoy multi cuisines, be it the home-grown iconic food chain such as The Big Chill, the South-African giantNandoâ&#x20AC;&#x2122;s, the American all-day diner- TGIF including Smoke House Deli, Mocha Art House, Kainoosh and Keya which makes it best place to hang out in Delhi. More than anything else, this largest mall in Delhi- DLF Promenade have adopted new-age technologies to offer a unique experience to consumers. They are strictly transforming into community spaces to stay relevant to the increasingly discerning Indian customers. Besides ambient shopping, they provide Indian consumers a lot of comfort and enablement at every level from their mall visit. Today, this Indian mall is constantly striving to provide experiences that couchbased shopping simply cannot match and rapidly evolving in the 21st century.